Many people have written to profess their love for the Breakaway Dogs Mold, and we’ve also received several requests to make larger bars of those images. In response, Good Dogs and Good Dogs 2 are now available! 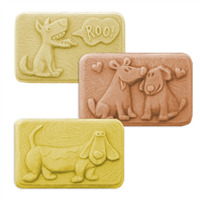 The Good Dogs soap mold features three playful pups napping, dreaming of a bone, and wearing a stylish wooly sweater. 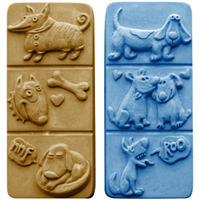 Bar Depth: 1.25" Bar Length: 3.25"
COMMENTS: I like these molds for my customers who have dogs. The good aspect is that they are deep, making a good size bar. 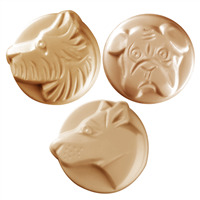 The dog images are deep enough that they are easy to fill with a dropper to have a color for the dog or bone that is different from the bar color. The thing I don't really like is that the dog images are pretty silly and not realistic like any real breed of dog. I'll probably switch to a paw print mold for these soaps but this served its purpose. They are easy to unmold.